Reflectivity images are just as they sound as they paint a picture of the weather from the energy reflected back to the radar. Reflectivity images are the vast majority of radar images you will see on television as well. There are two types available on the web; Base Reflectivity (½° elevation) and Composite Reflectivity. A Base Reflectivity image indicating precipitation. Taken from the lowest (½°) elevation scan, base reflectivity is excellent for surveying the region around the radar to look for precipitation. 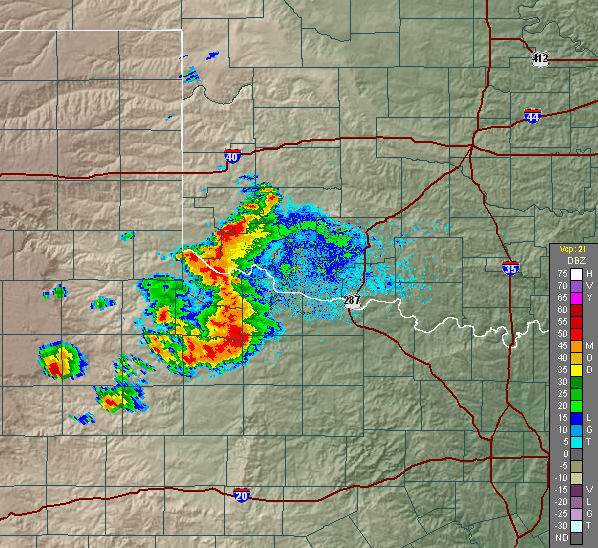 This image (right)(above) is a sample base reflectivity image from the Doppler radar in Frederick, OK. The radar is located in the center of the image. The colors represent the strength of returned energy to the radar expressed in values of decibels (dBZ). The color scale is located at the lower right of each image. As dBZ values increase so does the intensity of the rainfall. Value of 20 dBZ is typically the point at which light rain begins. The values of 60 to 65 dBZ is about the level where 1" (2.5 cm) diameter hail can occur. However, a value of 60 to 65 dBZ does not mean that severe weather is occurring at that location. Hail that is totally frozen (without a thin layer of water in the surface). "Dry hail" is a very poor reflector of energy and can lead to an underestimate of a storm's intensity. Atmospheric conditions such a ducting. 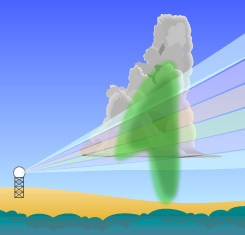 When ducting occurs, the radar beam is refracted into the ground (indicating stronger storms than what are actually occurring). However a worse case is when subrefraction is occurring and the beam is overshooting the most intense regions of storms (indicating weaker storms than what are actually occurring). Doppler radars that get out of calibration. The radar can become "hot" (indicating stronger storms than what are actually occurring) or "cold" (indicating weaker storms than what are actually occurring). The radar beam spreads with distance meaning the most intense part of the storm's reflected returns will be averaged with the weaker portions leading to an overall appearance of lower intensity. And, last but not least, the radar beam increases in elevation as distance increases from the radar. At increasing distance, the radar is viewing higher and higher in storms and the beam may overshoot the most intense parts. When all returns from all elevation scans are compiled an image is created which takes the highest dBZ value from all elevations, called Composite Reflectivity. It is a picture of the strongest returns from all elevations. Composite Reflectivity looks at ALL elevation scans in order to create an image. When compared with Base Reflectivity, the Composite Reflectivity can reveal important storm structure features and intensity trends of storms. This is important because often during the development of strong to severe thunderstorms, rain-free areas (or areas with light rain) develop as a result of strong updrafts. Yet, because it requires all elevation scans to be completed, unlike the Base Reflectivity being the first image created, Composite Reflectivity is the last image created in each volume scan. Therein lies an important point when viewing composite reflectivity images; always check the time of the image. Often, the base reflectivity image and composite reflectivity image will not have the same time with the base reflectivity image being the most recent. When compared with Base Reflectivity, the Composite Reflectivity can reveal important storm structure features and intensity trends of storms. This is important because often during the development of strong to severe thunderstorms, rain-free areas (or areas with light rain) develop as a result of strong updrafts. In the loop (right)(below) it will change to the base reflectivity image from the same time as the composite view. The first thing you will notice about the composite image is there is much more "green" color near the radar, located at the center. When higher elevation scan information is included in the composite reflectivity, it appears to indicate more widespread rain. However, the base reflectivity images does not show that rain so it is probably not reaching the ground but evaporating as it falls from very high in the atmosphere. Evidence of very strong updrafts (leading to the possibility of severe weather) can be seen when comparing the two images. At #1, the fuschia colored region, visible on the composite image, is all but missing on the base reflectivity. Remember the old adage "What goes up, must come down", using the color scale, this area is at 65 dBZ on the composite image. It is an area of concern as this is probably hail that has yet to fall. Some or most of the hail may melt before reaching the ground but at the very least, intense, blinding rain may be about to occur near this location. The notches, at #2 and #3, show more rain supported by strong updrafts. Those locations require additional interrogation to determine what is taking place at these locations which will come from the velocity products. One other note of caution, due to the time it takes to produce and transmit an image, all radar images show what HAS happened and NOT NECESSARILY WHAT IS happening. The dBZ values equate to approximate rainfall rates indicated at right. These are hourly rainfall rates only and are not the actual amounts of rain a location receives. The total amount of rain received varies with intensity changes in a storm as well as the storm's motion over the ground.